This project shows how to build a rope tree swing with details for selecting the proper type of rope, tying the specialized knots required for safety and to prevent damage to the tree limb. This swing can be tied to a high tree limb while keeping your feet on the ground, there’s no need for a ladder. My daughter really enjoys it, however I made it large and strong enough to seat two adults. 5/8in diameter hollow-core braided polypropylene rope, ~100 feet length. The 5/8 inch braided hollow-core polypropylene rope I used in this project has a safe working load of 294 lbs. The “working load” of a rope is about 1/5 of it’s total tensile (or breaking) strength, and the tensile strength of this rope is 1400 lbs. In the next photo, the rope appears to be 3/4 inch diameter; under load it thins to 5/8 inch diameter. The only difference between the two ropes here is the color. It’s important to use a large diameter braided rope for the swing. The use of a smaller diameter and/or twisted rope will be too slippery on the chain link and may cause the seat to tip over. Nylon rope would be an upgrade over the hollow-core braided polypropylene rope used here because it’s a stronger (and more expensive) material. A nice overview is of twisted and braided ropes is at Rocky Mount Cord Company, Inc.
Building the tree swing presented a bit of challenge because my 24 foot extension ladder wasn’t tall enough to reach the high and strong branch on the oak tree. Normally, I’d tie the rope to the tree branch using a Swing Hitch knot, but it requires putting your arms around the branch to tie the knot. The Swing Hitch must also be loosened and retied at least once a year so it doesn’t strangle and kill the branch as the tree grows. Since I couldn’t reach the branch, I had to figure out a way to tie off the lines from the ground. I solved this problem with kite string and a Running Bowline knot. The seat is a 36 inch length of 2in by 8in pressure treated lumber. The seat reinforcements are a 4in length of 2×8. Mark and saw the 36 inch long bench seat and the two 4 inch reinforcing blocks. Bevel (i.e. round off) front and rear edges of the bench seat with sandpaper. This is so the edges of the board won’t cut into your thighs when sitting. Attach the reinforcing blocks to the bottom ends of seat with Gorilla Glue and the five 3 inch wood screws. Notice the screw pattern is laid out to avoid the drill holes for the rope. Locate and drill the 3/4 in holes for the rope 2 inches from the outside end of the seat and 1-1/2 inches from the front and back sides. Here’s a closeup of the reinforcing block attachment and holes. As described in The Challenge section, the tree limb was too high for my ladder and climbing the tree was possible. The solution for attaching ropes to the tree limb is a Running Bowline knot, a type of slipknot. A key benefit of a slipknot is it expands as the tree grows and won’t strangle the limb. To reach the limb, I tied a small rock to a spool of kite string and threw the rock over the tree limb, letting the string run off the spool. This took a couple of tries to get it where I wanted. With the kite string looped over the branch, I tied the free end of the kite string to the 5/8 rope and pulled it back up and over the limb. You’ll need a double length of rope to do this! Cut each rope hanging from the tree limb off at ground level. Remember it requires a double length of rope to drape it over the tree limb and run the Running Bowline knot up to the branch. For example, if your branch is 20 feet high you’ll need 80 feet of rope (80 ft = 20 ft * 2 for the temporary double length over the branch * 2 for the branch suspension ropes). Adjust your estimates accordingly based on the height of the tree branch. This project is continued in How to Build a Rope Tree Swing – Part 2. Keep it up! Thank you for these good moments reading your blog. Just subscribed to your feed. I searched many sites looking for clear directions that I am my 2 girls could follow. We now have a wonderful swing in our front yard oak. This was a great Mommy-Daughter project! Hey man awesome project. Very descriptive. I had planned on hanging a swing from a very high branch and had thought of using the Running Bowline but had no idea how to tie it or what it was called. This was surprisingly very helpful, great resources on those knots. I’m pleased you found the my instructions helpful. If your swing isn’t swinging straight, the seat probably isn’t level left-to-right as when sitting in the swing. This makes one side “heavy” and the swing will be off balance and tend to move toward that side. If you don’t have a carpenter’s bubble level, eyeballing it should be close enough because great precision isn’t needed here. To correct the problem, you’ll need to adjust one (1) seat bottom stopper knot on the low side to raise and level the seat. Again, only a single stopper knot needs to be adjusted. The tree branch and the ground for my swing are both uneven as you can see in the project photos, but the seat is level so it swings straight. If you’re still having problems, post a picture of your swing at http://tinypic.com/ (it’s free and requires no account registration) and reply with the link to the photo so I can see what you’re doing. You Rock! I followed your directions exactly and have a great swing! You made it so easy! Everyone is amazed when they see it because the limb is way up! And the kids love it…can’t get them off it! Thanks – I appreciate the compliment! 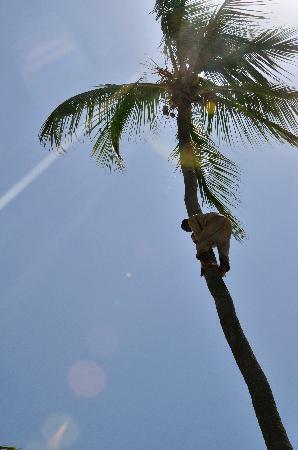 Tell everyone you climbed it like a coconut tree to reach that high limb! Can solid core rope be used instead of the hollow core? A weather resistant solid core rope will work if rated for the same tensile strength. Many, many thanks! I reached folk-hero status with a little local family by giving them a swing on Independence Day, on a branch 25 feet up in an oak tree. The plans and the knots worked like a dream. Very easy to follow. We had the whole clan on the patio watching the assembly. And when I cut the dangling ropes about 5 feet off the ground . . . they were absolutely agape. It was great fun. I said that the girls could just use a ladder to climb on! They made so much fun of me . . . until I finished the project with the chain links and the bottom section of rope. We all appreciate your help. You’re welcome. Thanks for the success story! I just put up our swing today. Thank you! Your directions, especially the knots, were spot on. My four and one year-old are loving their swing. Best of all, I did it myself! Hello Bob, I have wanted a tree swing in my back yard for EVER. Problem is, I don’t have a big tree. Darn it. I thought a great tree replacement would be a light pole that are used for traffic lights. I have tried to get information about the light poles and have found dead ends everywhere. I live in Minnesota. I think the light poles are aluminum? I think they could be very strong if they were secured to the ground with footings and decorative pillar looking bases. What do you think? am I nuttier than normal? Could you help me accomplish a dream so I don’t have to wait to grow a tree? I think I can help with your dream. Please see the new section titled “What if you don’t have a Tree?” at the end of Part 2. Send me a picture if you decide to build the rope swing support frame. I can’t thank you enough for such great directions! I am a Marine Corps spouse with a husband deployed to Afghanistan. I just moved my family to a new house and a giant tree in our front yard was begging for a swing. I followed your directions to a T. (I even printed them and set them on a table in the yard next to me as I was trying to tie the knots!) You made it so easy and it’s so well put together. My neighbors are truly impressed – I am super proud of myself – and my daughter, age 5, is over the moon about the swing! Thank you, thank you from a mom who couldn’t be happier about the memories you just helped give to my children. I am humbled and so pleased you were able to build the swing! Please send a photo when your husband gets back with the family by the swing and I’ll post it here. Thank you!!! I just sent this page to my husband and we will be taking on this project next weekend!! I can’t wait to watch the kids enjoy the swing…and plan to have a “witch” sitting on it for Halloween. How fun!!! If the weather’s good we’ll use it in some photos for my youngest daughters wedding next Saturday. Hey – Send some photos and I’ll post it here! Awesome job. Love the site. I thought I might suggest a possible problem which could be causing some of the swings to not swing straight, other than what you have already stated. An easy mistake to make, that can be easily hidden depending on the height of the branch, is having the Running Bowline Knots around the branch in different directions. One tied one way and the other tied the in the opposite direction. This can cause the knots to grab the branch differently resulting in a twisting motion causing the swing not to swing straight. Hope this makes sense and is helpful. For this project, do you have to use gorilla glue or will any wood glue work? Any waterproof wood glue should be fine. Thanks for the detailed instructions. I was trying to follow and build a tree swing but I ran into a cpl issues and I was wondering if you’ll have time to respond. 1. I bought the pressure treated wood a cpl months ago from Lowe’s. It was lying in my garage since I didnt quite get around to work on this project till now. Today, when I tried to attach the the seat reinforcements using the screws, the wood would break (the pieces also seem a little bent). Why do you think that should happen ? So I was wondering that I should forego the seat reinforcement step completely. Do you think that poses any safety issues ? 2. I bought one rope (as indicated in your instructions). If I cut the rope, it may have threads that hang out. Is there a way to infuse them together ? Or should I have bought two ropes. Pressure treated wood has a very high moisture content from the chemical preservatives and shrinks as it dries – this is what caused the warping and cracking in your board. I would start over with a new boards. Since new pressure treated boards can literally be soaking wet, lay them in a dry location with plenty of air exposure on all sides for a week to let the surface dry. I recommend installing the seat reinforcements for the reasons you stated – it distributes the load and reduces the likelihood of a crack causing a failure, pinch or splinter. The Gorilla Glue does wonders to form a solid bond and it’s water (slightly damp) activated. The wood screws provide the clamping force for the glue and additional reinforcement. You can always drill 1/8″ pilot holes for the wood screws if strain relief is needed to prevent dry wood from cracking. Fuse (melt) the loose ends of synthetic rope together to prevent fraying by waving the rope end over the flame of a butane lighter. Heat the rope slowly so it doesn’t catch fire. Thanks for your quick response Bob. I guess I will start with the new boards then. Another question though : wont they warp after the swing is made and hung ? Why is it important to use pressure treated wood for this project. I have never done a woodworking project before so I guess these may be too basic questions – I apologize. Also, I could not find a drillbit which will drill a 3/4inch hole so I went to the guy incharge of hw at Sears and asked him how that can be done. He suggested I buy a 3/4inch spade bit (which I did). We shall see how that goes. Pressure treated wood will last outdoors for many years. An untreated board wouldn’t last many seasons. Long thin boards that are not fastened down or stacked properly tend to warp the most, it also depends on which section of the log the board was cut. A 3 or 4 foot 2×6 board shouldn’t noticeably warp. The seat reinforcements will help stabilize the board. #2 pressure treated southern pine is the most common lumber. When buying boards, I always look down the length of the board for twists, too many or large knots, sections of bark, etc. I often reject five or six boards for each one I put on the cart and take to the checkout counter. Yes – use a 3/4 inch wood spade bit. Hi Bob, How far apart should the ropes be on the tree limb? The ropes should ideally be spaced equal to the width of the seat attachment. I see you’re in the Birmingham, AL area. Call up one of the Home Depot’s in town and ask for “Crown Bolt 5/8 in. x 200 ft. Solid-Braid Poly Rope Black“, Store SKU # 544774. It’s about $100 for a 200 foot roll and also sold by the foot cut to length. Thanks so much, Bob. I will try HOme Depot. I tried Lowes, and couldn’t find it online at Home Depot, but I’ll phone them and see. And I’ll let you know if it works. Oh-h-h-h! I was looking for polyester, instead of polypropolene. Sorry! I found it with no trouble at Lowes. Thanks!!!! Built this swing over the weekend. I’ve gained superhero status with my kids (and my wife too). Excellent! Thanks for the note! Hi Bob, I am planning on building the swing soon. I looked on the Home Depot website for the “Crown Bolt 5/8 in. x 200 ft. Solid-Braid Poly Rope Black” per your recommendation in an earlier post. I am a little concerned about some of the warnings regarding the rope.. thoughts? Thanks! Warning: Avoid using a knot; splicing is preferable. Knots reduce the strength of the rope up to 50%. Do not use this product for overhead lifting, support of human weight or athletic equipment, or other situations where personal safety or valuable property can be endangered. The working loads shown should never be exceeded. Additional care must be exercised when using this product under shock (stress, jerk) conditions. These conditions can reduce working loads by as much as 33%. Never stand in line with rope under tension; such a rope, particularly nylon rope, may recoil (snap back). The rope specifications state a “Working load limit of 294 lbs”. Let’s assume the knots reduce the working load by 50% as cautioned, leaving a de-rated working load of 147lbs. Since there are two ropes supporting the swing carrying 1/2 the load each, the swing working load is back up to 294lbs or something in that area. Let’s add an additional safety factor and call it 200lbs actual working load for the swing. Most kids will weigh well under 100lbs, so the 200lbs actual working load is adequate. After mowing the yard for 2 hours last weekend, I relaxed sideways in the tree swing with my feet propped up on the inverted V seat ropes – it’s actually comfortable this way. The 3-1/2 year old ropes supported my 220lb frame just fine and looked as good as the day I built the swing. You can use a thicker / heavier rope with a greater working load or purchase the really high quality & expensive mountain climbing rope to suit your preferences. I have a swing that doesn’t swing! Go figure. I really appreciate the clear direction you’ve provided here and have built a swing exactly to your specifications. My kids love it–if I push them. The trouble is, there’s seems to be no way to “pump” on the swing and get it to reach any kind of height. My kids can’t do it and neither can I.
I have a huge oak tree that I’ve attached my swing to. The branch is almost exactly horizontal and probably 12″ in diameter. The rope spacing on the branch is about 3′ apart. The distance from the bottom of the branch to the seat is about 20′. The seat is about 1’6″ off the ground. 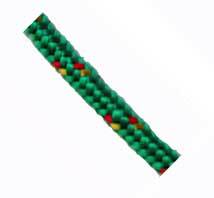 The rope is 5/8″ braided poly. The rope is attached to the branch with a running bowline knot. No amount of “pumping” will cause the swing to reach any kind of height. I’ve never experienced this before on a swing. The knots on the tree limb don’t seem to be moving and the limb is also not moving under the weight. I’m perplexed. I also admit that physics was not one of my best subjects in school. Please help me and my kids with this wonderful swing. I’m happy to provide pictures, video, or anything else which will be helpful in diagnosing our problem. My kids would get going by pushing backwards off the ground, or walk backward then pick up their feet to swing forward. But my daughter was already 10 years old and long legged when I built the swing. I’m guessing your children are much younger since the seat is only 1-1/2 feet off the ground. What’s probably preventing the “pumping” action from working is a combination of limited body weight and the A frame rope seat attachments working against the pumping motion. Pumping means leaning way back and then forward to shift the center of gravity away from the seat to cause motion. Doing this in rhythm makes this swinging action. The A frame rope seat attachments are very stable and tend to limit the shift in center of gravity compared to single rope on each side of the seat. In combination with a small child that has limited height and body weight, I can see pumping would a challenge. Drill a hole in the center of the seat between the two existing rope holes for a single rope attachment point at each end. This will make the seat less stable (and prone to spilling the little ones), but it will make pumping much easier because smaller shifts in the center of gravity will have more effect. If this works, plug up the outer rope attachment holes so someones finger doesn’t get broken. The knots on the tree limb shouldn’t move by design, this protects the bark so it doesn’t rub off and kill the limb. First my kids painted some pine boards for the seat. I chose to glue and screw two 1×6 boards together and cut them to length. This gave two equal sides to the swing so I can turn it around later if needed. I chose 5/8 braided nylon black rope and used the bowline at the top. I works great. Thanks for the great posting. Great write up, Bob! You’ve helped me get my rope swing project off the ground. I have a single person hammock swing that I’ll be attaching to a branch about 40 ft. off the ground to a mature oak branch in my woods, over a stream. Getting the guide line and rope over this branch will be a major challenge, but assuming I can get it over, I’ll be using your suggested double running bowline knot to secure the single line of 1/2″ polypropylene rope. I noticed that your ropes are making direct contact with the branch. Is there a reason you didn’t use a cambium saver? I’m on the fence right now, but suspect it may not be necessary since the shallow swing angle and single line attachment using the bowline knot will prevent the rope from sliding back and forth over the branch and damaging the tree. Have you noticed your ropes sliding across the branch? Are they digging in or damaging the bark? Should I play it safe and buy a cambium saver, like this one? A hammock over a stream… cool! My rope tree swing hasn’t worn the bark in 4.5 years. The rope pivots at the bottom of the running bowline knot without rubbing or rotating the knot. A cambium saver sounds like a good idea, however that leather model is designed for tree climbing and I don’t see how you’d fit it around the bulky bowline knot. I doubt leather would hold up to rain & sun for very long. Tie a 1/2 or 1 oz. lead sinker to some fishing line. Cast it over the branch with the fishing pole. Tie the rope to the fishing line and draw it up & over the branch. I would like to make them 30″ or so. Would this make a difference in the operation of the swing or a safety issue?? Shorter seat ropes should be fine. If you’re not satisfied with the action of shorter ropes, you can easily replace it with longer (or shorter) lengths. Thanks for the awesome instructions and pics for this project. I built one over the weekend for my 6 and 3 year olds. They absolutely loved it! I did go with a 2″ X 10″ pressure treated seat which seems to work just fine and possibly even adds some additional stability. I went ahead and used a countersink for the screws when attaching the reinforcement blocks to the seat bottom to avoid splitting. Thanks again BOB! Many years of swinging enjoyment for the kids! Will the double bowline technique work for single rope swing? How do you get the rope out of the tree if you want to remove swing? The Running Bowline knot is suitable for a single rope swing, e.g. a round seat or foot hold. Be mindful of the working load for single rope swing is about half compared to a two rope swing, so you may want to upgrade to a 3/4 inch or even 1 inch rope if adults will be enjoying the swing. Larger diameter rope is easier to grasp, too. To remove rope from the tree limb, you’ll need to figure out a way hook the loop on the tree limb to pull it down, basically reversing the slip knot installation. I have a telescoping fiberglass pole saw that I use for odd jobs like this. Unbolt the curved saw head and duct tape a utility hook to the end for reaching high places or into crawl spaces. You could do 20′ with approx. 60′ of rope if you don’t cut it until the first loop is up. Would you have any ideas for how to build a boom for a rope swing. That is, I have a nice tree but it doesn’t have a good lateral branch for the swing so I was thinking of putting up some kind of boom to hold the swing away from the tree. I don’t want to hurt the tree so was wondering how to do it without nailing into the tree. Seems like it will be hard to hold it stationary – I don’t want it t swivel with the force of each swing. Any thoughts? thanks!! Maybe a 6×6 inch wood post set 4 feet deep in a concrete footer with a cross support between it and the tree trunk? It would be a lot of work. If there’s another tree nearby tying the rope swing to a heavy support rope between the two trees would be simpler. This site here suggest that Polyester rope is better to use than Polypropylene since Polypropylene deteriorates in the sun’s UV rays. I looked at the quickly written tree swing article on that other website you referenced and understand why you’re reading my project for detailed instructions. Polyester rope is the most UV resistant and indeed a better choice… if you can find it. The larger diameters of polyester rope are only available in the twisted style (as opposed to braided) at the home improvement stores. Maybe a marine supply store or outdoor outfitter will have it? It’s been 6 years since I built the tree swing and the polypropylene braided rope isn’t showing signs of deterioration, albeit my swing is in a heavily shaded area under a group of trees. Hello Bob, on your tree swing how short can i make the seat ropes? I’m building the swing for a 2 yr old, and she must be able to grab the single rope, right? For a 2 year old I would make a narrower seat such that she can grab the ropes on both sides of the seat. Recommend keeping the seat ropes at least 2-1/2 feet long from the seat to the chain links because a shorter loop length might present a choking hazard for the little ones. THANK YOU! Since the lowest decent branch on our tree is 23 feet in the air I was struggling with how to get the rope up there. The bowline knot worked perfectly! GOD BLESS YOU! thanks for this awesome tutorial. My 7 year daughter and I worked on this together and now she’s got a fantastic swing in the backyard and she learned to saw, tie knots and drill. This is a memory for the rest of our lives, thanks Bob. Your note made my day! Thanks for the info! I read online that polypropylene rope can degrade under UV. My rope is likely to get quite a bit of direct sunlight on it. Is this going to be a problem for my tree swing? Hi – see this other Q&A about polypropylene concerns and using UV resistant polyester rope instead. My kids seem to think that a 36″ seat seems too long? Is there any reason why 24″ or 30″ wouldn’t work? The seat can be made to any width. I made the seat wide enough for two children because it was usually my daughter and her friend on the swing. THANK YOU! THANK YOU! THANK YOU! I have wanted to put a swing in a very tall oak tree in the front of our house for years. My husband has not been very keen on the idea. I found your article and decided to try it myself. With the help of my now 16yr. old son to throw a weighted tennis ball up to the limb roughly 40-50 feet up we were able to send a guide rope up. We have now attached the heavy duty polypropylene rope using the running bowline. I have a question though. I used a “Heavy Duty Diamond braid 1/2 inch polypropylene rope”. It has a stated working load limit at 310 lbs and that was why I chose it over the 5/8″ which had a lower working load limit. Do you have any thoughts on this?? Do you think this will be sufficient as my kids are older 11 and 16? I am actually really looking forward to sitting in it myself and reading a book! Let me know what you think. I appreciate your input! P.S. I will send a photo when we finally have it up! I used the 5/8″ diameter rope with a 294 lb working load because thicker rope is easier to grasp without biting into a child’s hand. That’s only 16 lbs less working load than the 1/2″ dia. 310 lb rated rope you used. It’s not the age but the weight of the rider(s) using the swing. If you allow for a 50% reduction in rope strength due to the knots and the load is equally distributed across the two swing ropes, the swing should safely support up to a ~250 lb rider (in rounded figures). Thanks for the guidance. I used several of your tips in order to build a swing with my kids. The knots you shared were particularly helpful, as well as the tip to split the seat in two. We had a blast hanging it together around Christmas. Created some memories which will last forever. We built our swing seat out of western red cedar, and assembled it with brass wood screws, then coated it with a couple coats of polyurethane. I hope it will last for many years to come. We also included stenciled letters on the underside. The was accomplished using a reverse laser printout on paper, and then ironing the paper to transfer the letters (toner) to the wood. I was then able to go over some of the larger letters with a wood burning tool. You’ve put together a great how-to, and my kids and I really appreciate it. to hang the swing from. Oh no! Joist hangers are terrible idea because they aren’t designed for dynamic loads such as swing moving back & forth that would cause a twisting motion. You also have to account for the tree trunks bending in the wind. A wood beam and joist hangers is an attempt to create a rigid immobile connection between the two tree trunks. On a windy day the trunks will bend and sway causing the nails or screws to back or tear out. Also, the trees will grow bending or crushing the fixed length wood beam. A better solution are two galvanized or stainless steel lag screw eyes. Drill a 3/8 inch pilot hole in each tree trunk, then twist in the lag screw eyes. You’ll probably need a steel rod like a large socket wrench handle through the eye loop for leverage to twist them in the trunk. Hang the tree swing ropes from each screw eye. Now you have a fully mobile solution that doesn’t interfere with the tree swaying. Use at least 5/8 inch diameter shank lag screw eyes with a 4-1/2 inch long shank. Lag screws are critical because it has the coarse threads for wood. Notice that a forged lag screw eye has a solid eye loop that can’t bend open under load as compared to a “wire” eye bolt whose loop is bent closed. The lag screw eyes shouldn’t damage the tree according to Tree damage caused by treehouse building by the The Treehouse Guide. Hi-This tutorial is magnificent!! I built a swing that is almost exactly like the one you detailed. See pic..
My problem is that I installed 2 spring snaps so I can add other attachments (trapeze bar, baby swing, etc) but I have noticed that the rope is beginning to wear out right where the snap and rope meet.. Any ideas? Looks like you used a common twisted rope instead of the recommended synthetic braided rope. The thick fibers in the twisted rope are more prone to fraying. Any suggestions on how to get the ropes down to replace with new rope without climbing up the tree? A pole saw might reach high enough. It’s normally used for cutting tree limbs while standing on the ground. This is great and my girls (11 & 9) are going to love it. My question is about the treated wood. I’ve sanded the wood and rounded off all the corners so it’s smooth with no edges. My wife wants to prime and paint it right away for fear of splinters that may develop over time. My understanding from other projects using treated wood is that you should give it 6-12 months exposure before applying any paint or sealers. So, should we follow that guidance, or do you think it would be okay to prime and paint it right off the bat? Or I guess more broadly, do you have any suggestions for when to treat the wood, and with what substances to maximize the life of the wooden seat? I will also send pictures when complete. Thank you! Newly purchased pressure treated lumber has a lot of internal moisture from the treatment process and is often soaking wet. If allowed to dry for a month it should hold paint or stain. The other option is to buy Kiln Dried After Treatment (KDAT) pressure treated lumber. It costs more, is lighter, less likely to warp and ready to paint. The big box home improvement stores typically don’t stock 2x KDAT boards but the better lumber yards should have it. > what substances to maximize the life of the wooden seat? Any quality exterior paint or stain will do. Paint and darker pigment stains are better at blocking UV rays and last longer. Clear sealers will have to reapplied every year or so. Thank so for the quick response! Since I’ve already built the seat, we’ll go ahead and run with it and paint it maybe in June. Thanks again!! Hi Bob: I have looked everywhere trying to find out how to calculate the swing arc of a swing, so I don’t plant it too close to a fence or a tree. I have a disabled child who weighs about 130 lbs and she loves to swing as high as possible. I will be building a wood swing with chain or a metal swing with chain. It will be about 9.5ft tall. I don’t want to put the swing right in the middle of the open yard. I would rather put it on the side or the back of the property but I don’t know how much clearance she will need so she does not kick down a fence. Can you help with this? She actually loves having a post or something she can kick off of on the back swing and loves to twist and turn crooked. Any suggestions for making this possible or is it a really dumb idea. At another home, we had a rope tree swing and she kicked off the tree hooping and hollering with joy. And thanks for all your clear instructions and photos about swings. I love your site. See this Simple Pendulum calculator. Change the units to feet, degrees and pounds. Plugging in 130lbs, 9 feet long rope and 1/2 swing of 50 degrees (Angle alpha)… which is a lot, the seat will rise 3.2 feet above the rest position. However, the simplest way to estimate clearance in front and back of the swing is to toss a rope over the limb and walk it back & forth through the travel path. I’d make the swing seat from a 10 inch wide board. Or an 8 inch wide seat with a quality smaller diameter rope with a sufficient load rating.